I tried these two different ways and the second way worked best. 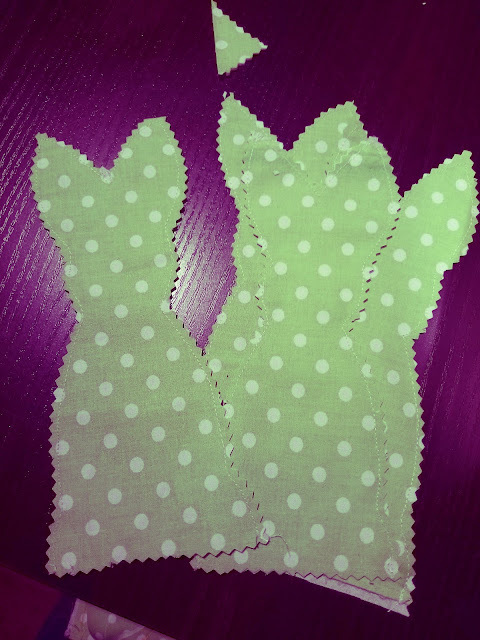 The first time I traced the bunnies on the fabric with the right sides facing down. I cut them out and then sewed them, but it was a huge pain because the sides didn't match. The second time I folded my fabric right side up and traced the bunnies on the fabric. I then sewed them before cutting them out since I knew I would be cutting them with pinking shears afterwards to get that shabby chic look. It made it a lot easier but I did get two bunnies less because I had to leave enough room for cutting afterwards. I stuffed them with filling and used a kabob stick to stuff the ears; I tied a bow around the neck and I was done. I am thinking I might hang them from the easter tree but I have to make sure it doesn't look a tree of "hanging" bunnies.